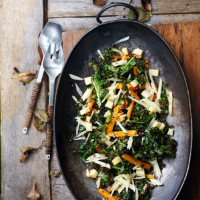 Roasting kale gives it a fantastic crunchy texture, which works beautifully with the apple, carrot, seeds and smoked cheese. You could also top it with a poached egg if you feel like it. 1. Preheat the oven to 180°C, gas mark 4. Place the carrots in a bowl and toss with the fennel seeds and rapeseed oil. Spread out on a large roasting tray and roast for 5 minutes, then add the mixed seeds and roast for a further 2–3 minutes until toasted and golden. 2. Add the kale to the roasting tray and toss with the carrots and seeds. Roast for a further 8 minutes until the kale is crispy. 3. Toss in the apple, smoked Cheddar and cider vinegar and mix together well. Season and serve warm.